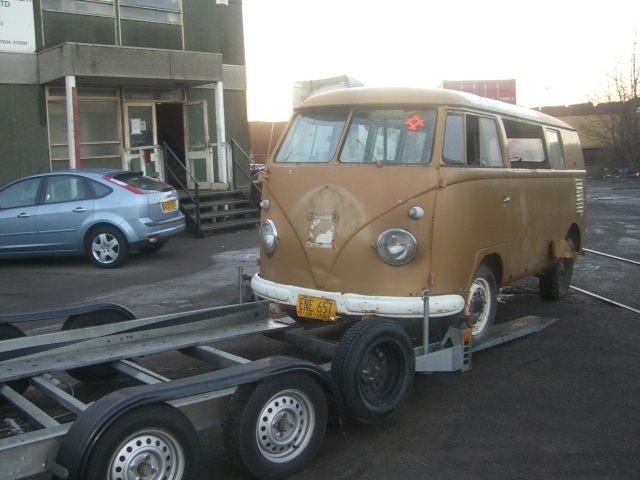 This is the project bus I just picked up. 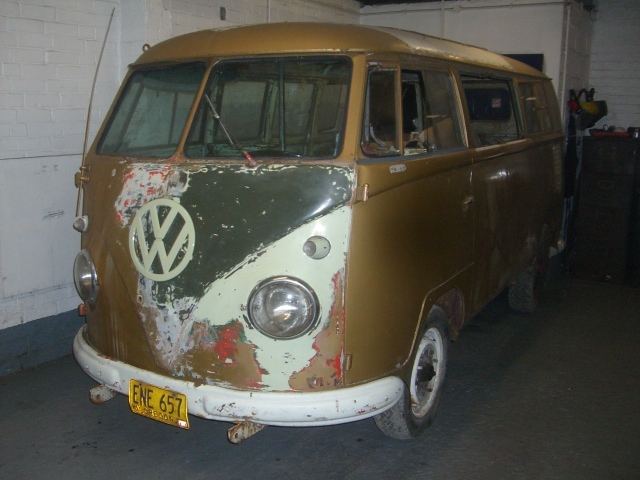 It's a '55 standard with a lot of hippie hack jobs, but little rust. 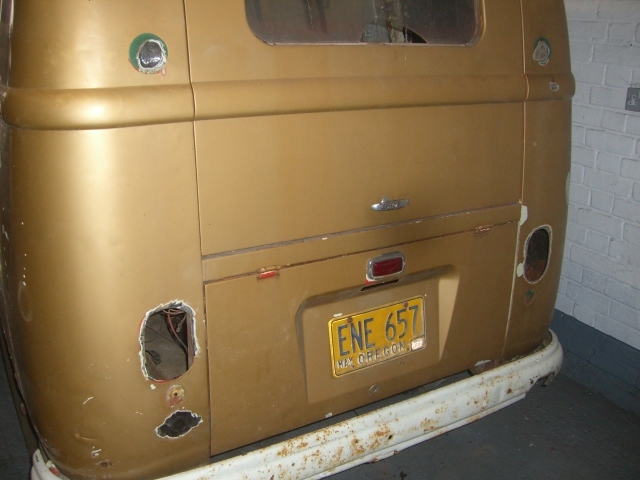 I'll let the pics speak for themselves..
A few years ago I wouldn't have even entertained this bus, but I wanted a '55 and this has a lot of the parts still on it- both pressed bumpers (including wolfsburg front one) brake light decklid with light and bulb holder, did have both rear reflectors, but one went missing during shipping I plan to take my time, try to expose the original paint and blend the repairs, paint underside and engine bay, etc.. 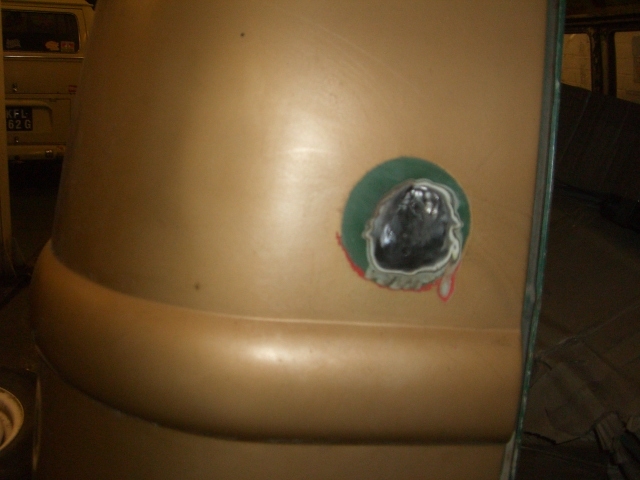 I had some aerosol cans mixed up and painted the emblem so far, as it had been blasted and left to rust. The original paint is still mostly pretty thick, but there are 4 thick coats covering it. The bumpers will get blasted and painted once I have done some dent repair and welded a section into the rear one, where someone cut it for the exhaust. The front bumper is currently welded to the towbar framework, so careful removal will be necessary. I have a clip for the side window piece and hack over the engine so far, but I am starting on the hundreds of small holes so far. First holes welded and ground back..
Great quality fat base repro mirror arms from so23westfalia. 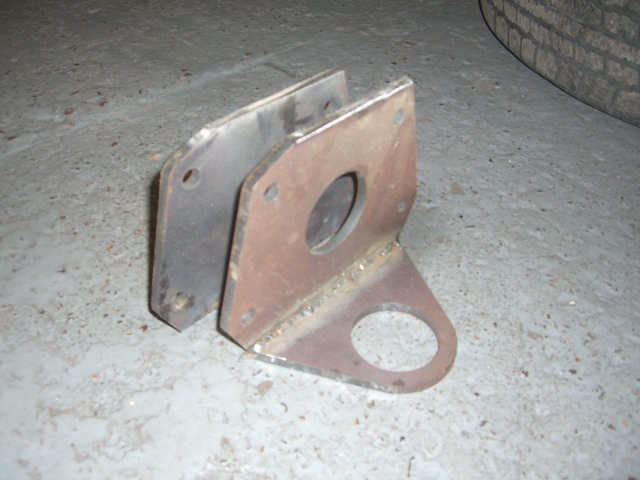 Today I built some brackets to bolt to where the front beam goes. They will have castors welded to them, so I can remove the running gear and roll it around easily. I plan to build a similar set up to bolt to the rear frame horns. Sweet radiused wheel wells, dude! glad to see someone finally bought that bus. Parts and mechanical restoration services available. I restore and rebuild fuel pumps, distributors, spindles, etc. Check my ads or send a PM. i remember that bus only because of the side window hack. never knew it was PGSG though. keep posting up the progress you make! Thanks for the replies, it was for sale on here FOREVER, I looked at it and discounted it so many times, but looked at what I could get for a lot more $$ and it finally became more attractive. I run a VW shop and sales business, so things that are worth a lot don't tend to hang around long. I decided this was my way of getting a 55 on a tight budget. Will be getting Gerson wheelwells, outer rocker and a couple floor sections. 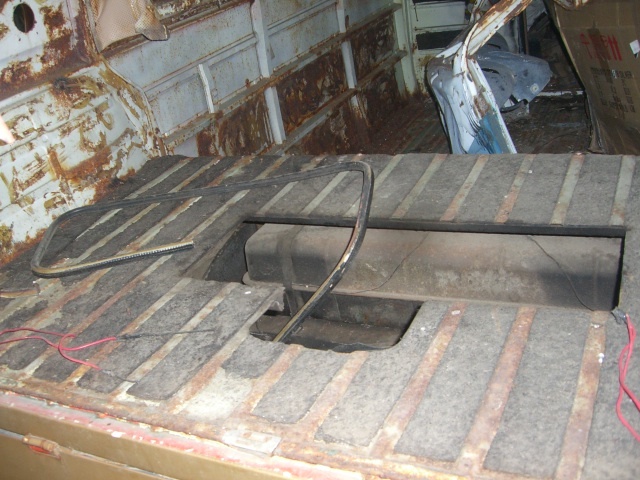 I will leave the big roof hole until last, when I have it on a rotisserie to paint the underside. way to step up to the plate. best of luck with it! can't wait to see it slammed and bagged, on fake earlies. Sorry to offend any of the stock height guys, but yes this will be lowered with a full bolt in setup, NO BAGS or earlies though. I figure it's MY BUS and no one else stepped up to the plate to save it, so it's gonna look how I want it to look. No tubs or steering box raise, but lowered narrowed, straight axle and a set of original wide 5 rims.. I don't see a problem with stock height buses, just not my thing right now and i figure as long as it gets saved, anyone who loves buses should appreciate that. i thought about picking that up time and time again as i was local to it. but it was a bit too hacked. glad someone got it, keep us updated!!! 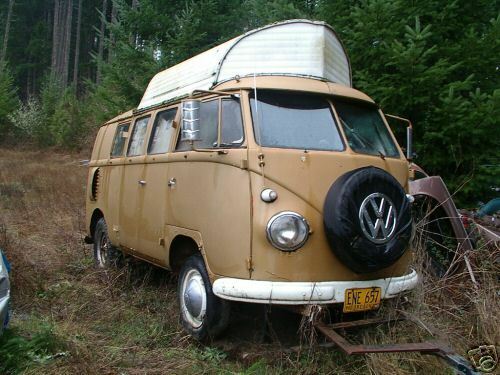 I was the previous owner to this bus that hauled it out of the Oregon rain forest. I got seriously injured and did not see myself getting to this anytime soon. I had to find it a deserving home. Really glad this bus found a good home. It definitely needed work but was really solid by todays standards. 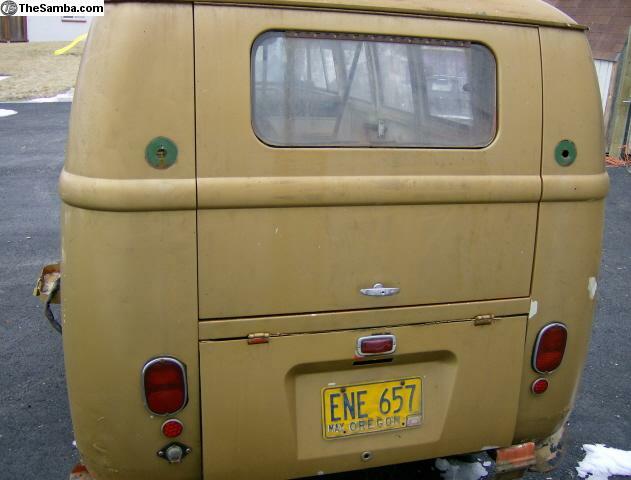 Little did he know but the hippie was probably the first in the world to have a rear safari window. 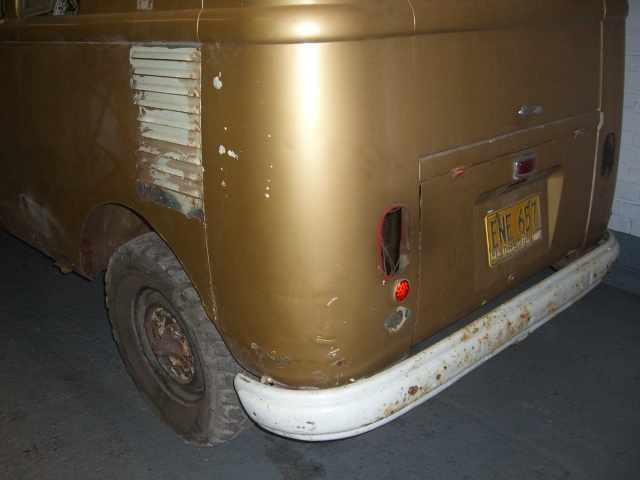 Maybe the current owner can show a better pic of the prototype rear safari from 1968. Also could you post the pic of how it looked when I found it with the camper canopy boat thing on the roof. Hope to see this bus looking good. Hey Greg, Here's the before pic i found on here. It's good to finally get hold of it and start doing the work. It's gonna be a back burner project for a while, as I have a notch to get on the road and a few company projects/customer cars to do. The rear 'safari' was busted in transit, but is about to hit the bin anyway..
Holy chit, that is one nutty highroof?! haha...VW emblem on the spare tire. Had a great morning this morning. 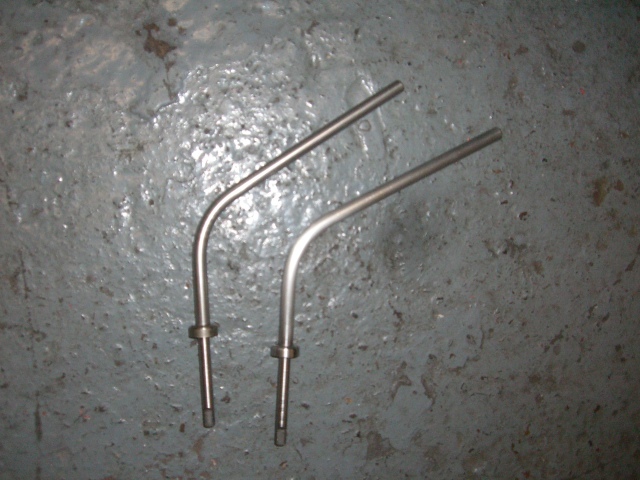 I welded up a few more holes on the rear end with great results. Next will be the taillight holes. I still need to find the measurements for the hole location, but will weld in steel, then use a hole saw to cut the holes. The best part of the day was when I was welding up the holes below the driver side taillight I fished my hand around behind it to get all the wires out of the way and found the missing reflector! It matches the one on the bus and is a 'big diamond' one (stamped Frese K1282 in the bezel) The bus is an early may '55. 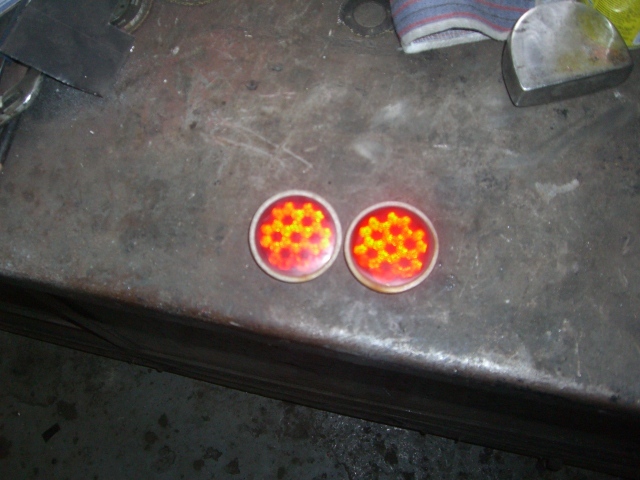 The reflectors both need new studs, but are uncracked and otherwise in good shape. Awesome that you found that matching reflector in there! 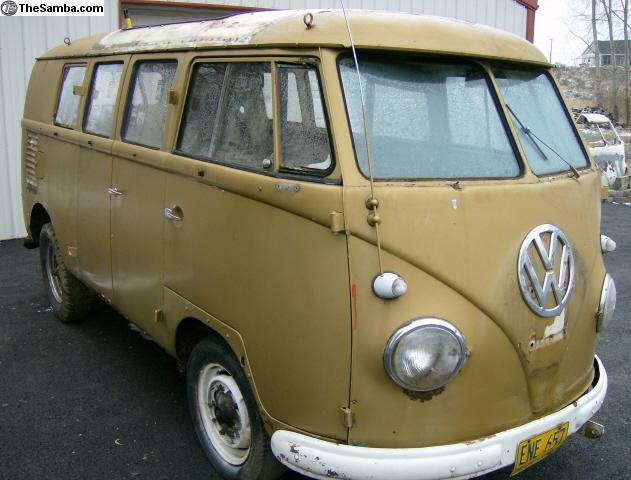 It matches the one on the bus and is a 'big diamond' one (stamped Frese K1282 in the bezel) The bus is an early may '55. The reflectors both need new studs, but are uncracked and otherwise in good shape. I don't think those are "big diamond" but they do appear to be correct for the bus.